LAWS IN THE WORLD OF DAVID LYNCH are unnatural but do not lead to order, and things disordered lapse into “thingness.” This should be one of Lynch’s favorite words, lent to him in that book by Dennis Lim: “In his own speech—and in the speech patterns of his films, with their gnomic pronouncements and recurring mantras—the impression is of language used less for meaning than for sound. To savor the thingness of words is to move away from their imprisoning nature.” Write down the “academic definition” of “Lynchian,” suggested and sent-up by David Foster Wallace in his notes from the set of Lost Highway, and then I’ll never say “Lynchian” again: “[It] refers to a particular kind of irony where the very macabre and the very mundane combine in such a way as to reveal the former’s perpetual containment within the latter.” Now say the word macabre over and over, silently or aloud to yourself, until the word has lost all definition to become a void, a nothing, a prenatal lump of sound. Now try it with human. 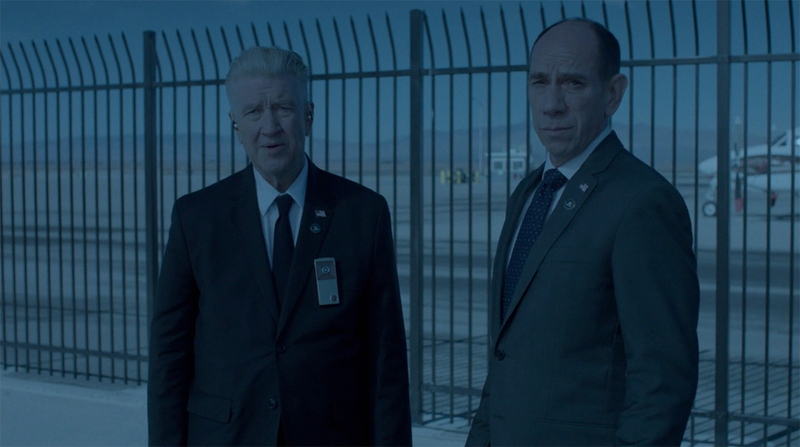 Twin Peaks: The Return, 2017, still from a TV show on Showtime. Season 3, episode 4. 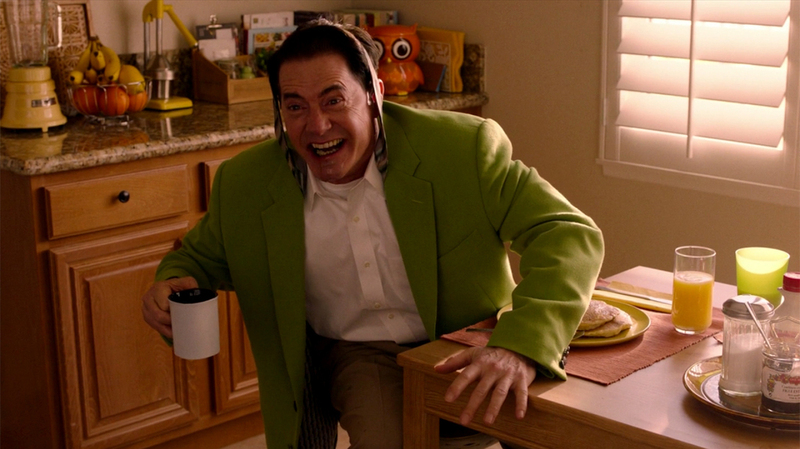 Dale Cooper (Kyle MacLachlan). Long scenes transpire in which Cooper may as well be an alien. Like the brother from another planet in the 1984 John Sayles film by that name, he has an unexplained power over things that plug into the wall, and simply by pointing at the slot machines, he wins twenty-nine jackpots. Like the invading body snatchers in both the 1956 Don Siegel film and the 1978 Philip Kaufman remake, he seems fated, despite this life-changing fortune, to end up a pod person. It is to the bright, clean, well-appointed life of the Joneses that he returns. We can’t keep up, but neither can he. Unable to speak except to repeat what’s literally just been said to him, he lights up for the first time at the breakfast table in the spacious eat-in kitchen. 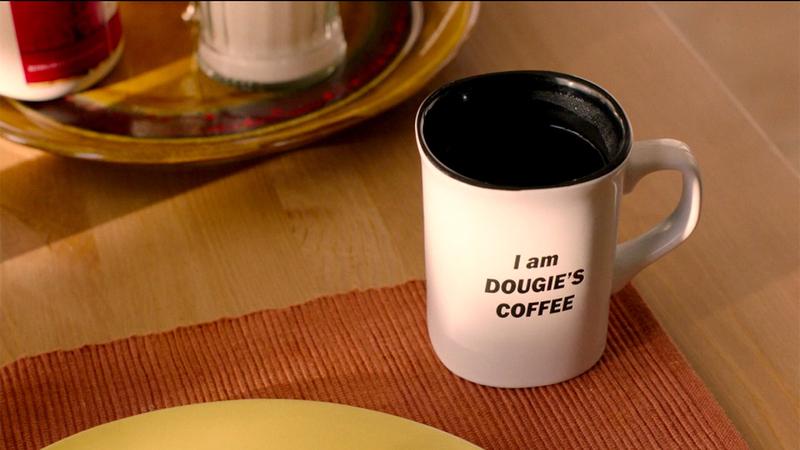 “Here’s your coffee,” says Janey-E, handing him a mug that says, in block letters, THIS IS DOUGIE’S COFFEE. “Coffee!” he gasps. Watching this the first time I sighed with relief, thinking it was all a bad joke about not being yourself before that first cup of coffee in the morning. Alas—he takes one sip and, like a goddamn baby, spits it out.